LL and I have been collecting games built on Luke Crane’s excellent The Burning Wheel role-playing game for a while now. I’ve had Mouse Guard, based on the David Petersen graphic novels of the same name, for some time and have longed to play it. We recently picked up both the base fantasy core book and Burning Empires, a game based on Christopher Moeller’s gorgeous Iron Empires graphic novels. We sat down to begin exploring the latter on Monday and discovered that it’s a pretty amazing game with a lot of potential. The book is absolutely beautiful. It’s nicely printed in full-color on glossy paper and runs to 655 pages. The organization’s a bit confusing at first but actually flows quite well for learning the game: a brief introduction to the setting and how the game works followed by the tools you need to get started playing. Most RPGs based on licensed materials start you off with a setting-dump and I was expecting something similar here. Seems that goes against Luke Crane’s basic philosophy and, after figuring it all out, I think I might agree with him. Still, the relative paucity of setting material sent me in search of a place to buy the Iron Empires source material! The dead-tree editions are more difficult to locate but you can get them in PDF format here and here. The setting is intriguing. Humanity, in its distance past, established a vast interstellar civilization spanning hundreds of light-years in every direction. At the peak it had mastered the manipulation of the fundamental forces of the universe and learned to shape planets and even humans themselves to its liking. Enter the vaylen, a parasitic worm-like creature that can merge with a sentient being and take it over wholly. The vaylen found humans to be rather delectable, an experience far more pleasant than provided by any of its former hosts (most of which have been bio-engineered creations). The Worm, as they are lovingly termed by their human enemies, took thousands of worlds and billions of human hosts and still hungered for more. By the time of the Iron Empires, humanity has fallen greatly since its heyday – with eight petty squabbling empires too concerned with gobbling up the remaining scraps of their former glory to focus on properly defending against the terror arrayed against their southern borders. The game system is also interesting. It’s not really a role-playing game. Well it is, just not in the form many modern players expect – a band of murder-hoboes moving from place to place, killing enemies and taking their stuff. Players and the GM take on the roles of central figures in one planet’s conflict between humanity and the vaylen but the game is structured so that you contribute to an epic story of that planet’s struggle. The GM is the pacer and arbiter of the rules, not the end-all authority whose word is law – he and his characters have to follow the rules too. The players help to create the setting during play, acting through their characters to defend their world, or turn it over to the Worm. You start by collaboratively building the planet under contest using the tools provided in the World Burner. The players and GM answer a series of questions about the world, its people and factions and so on, to flesh it out. 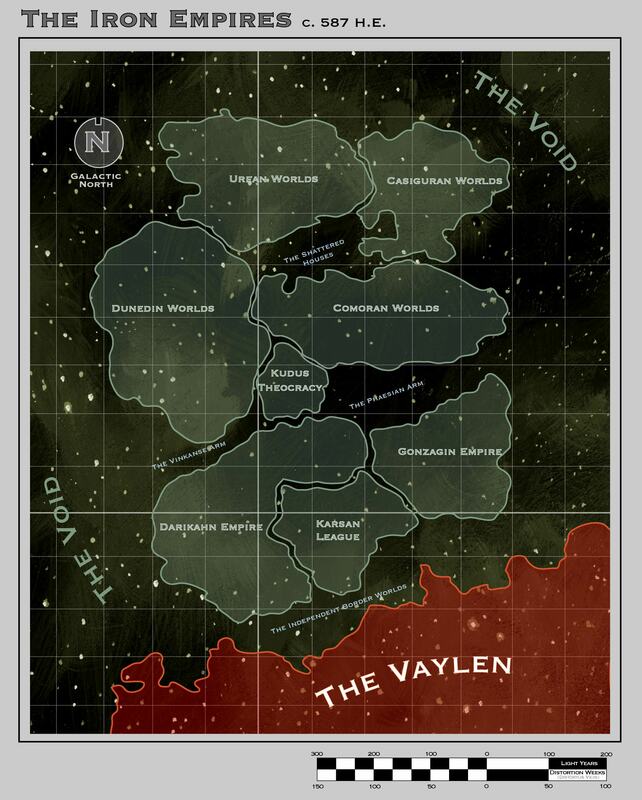 The end result is a battleground on which to play out the coming vaylen attempt to conquer it – including some mechanical details that become important to both sides once the conflict starts. You also come up with concepts for the central figures in the conflict, people who are key members of the government, church, military, and other important institutions. Players may choose to play some of these roles later, or create their own related characters, while the GM will flesh out and play the others for the opposition. Then you use the Character Burner to build up your character using Burning Wheel’s clever lifepath system to model her growth from birth to her present situation, which yields information about skills, resources, contacts, traits, and important mechanical statistics. When completed you’ve got your world and important institutions and a group of PCs and key NPCs that are all interlinked (to some degree) among themselves and the groups that make your world go. The default situation has the PCs working against the vaylen while the GM tries to win the planet for the Worm, but you can reverse those roles if desired. The game is then played out in three phases: Infiltration, where the vaylen begin their intrigues; Usurpation, where key figures are taken over and the stage is set for the end-game; and Invasion, where all pretense is dropped and the Worm arrives in force to claim its juicy prize – a new farm world brimming with delicious human host meat puppets. There’s a fairly complex system set out for players and GMs to create scenes and build to inevitable conflict situations, where the real stuff gets resolved. As things move forward, the sides gain or lose ground, resulting in an eventual winner and loser for each phase. The winner gets an advantage during the next phase and early gains could easily result in a steamroller effect as the campaign draws to a close. Of course a campaign in played out over tens of sessions so we didn’t get quite that far in our initial exploration! LL and I used the World Burner to start fleshing out a planet. We ended up with an “interior world”, not quite on the border but not quite in the safe core of one of our eight pocket empires. Its atmosphere supports human (and vaylen!) life and is predominantly (>50%) land but is geologically young and volcanically active. That makes it a good resource producer and we ended up deciding that it is administered not by the nobility but by a merchant league. It is protected by a professional volunteer military but nobody is all that bothered by the vaylen threat at this point – they’re focused on grubbing for ore for sale to their greedy neighbor lords. Factions include a competing merchant force, organized crime, and indigenous life-forms, all of which may become pawns in the coming war. The planet is protected by standard quarantine procedures and import/export regulations, paying close attention to weaponry, pharmaceuticals, and immigrant labor. We’ll add some color to the world next session and flesh out key figures but I think we’ve got the start to a pretty good battleground for a vaylen invasion. I picture it being a chartered merchant world somewhere in the Karsan League. Maybe it supplies fuel for Hammer fleets or ore to build their massive hulls. That would make it a prime target for vaylen take-over; not only would they gain human hosts but also resources from an under-protected, strategically important world in the midst of one of their strongest neighboring human empires. I’m definitely curious to see where it goes!